Having only recently stepped up from the Junior ranks into Clubman Light, Josh Raneri did not take long to find his feet in this hotly contested class. Josh is quickly establishing himself as one of the gun pilots in Clubman Light. 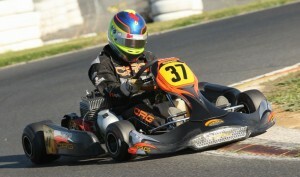 Racing in his CRG Black Diamond chassis, he proved so by winning on Sunday the 4th round of the Country Series at Ballarat.